Based in Akron, Ohio and last produced in 1962, The NORKA Beverage Company is back in business and reviving its original GREAT tasting sparkling beverages. 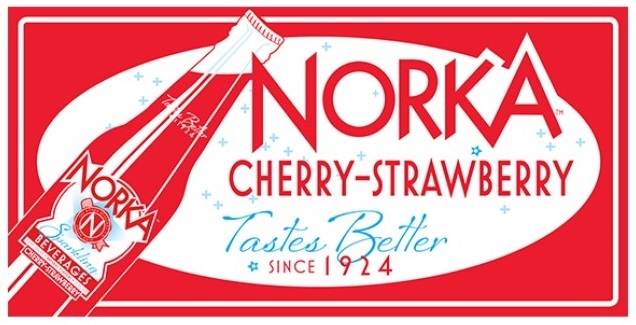 NORKA Cherry Strawberry Ingredients: Carbonated water, cane sugar, natural flavor. Citric acid, potassium sorbate (preserves freshness), sodium benzoate (preserves freshness), gum acacia, FD&C Red #40, glycerol ester of wood rosin. What's Norka? Spell it backwards and you have Akron – a small city in Ohio near us known as "Rubber City". First made in 1924, Norka's sparkling drinks vanished in the 1960s, until now. A native Akron man has brought back his beloved hometown soda. Enjoy a different taste than ordinary soda, subtle but sweet with natural flavors and pure cane sugar – no high fructose corn syrup. This is straight-up delicious. One of the driving forces behind craft soda is nostalgia. It’s a term that gets thrown around often, usually referencing the glass bottle the liquid comes in or a retro label. But this is a soda that tastes old fashioned. This tastes like soda you used to drink as a kid, that your parents used to drink as kids. There’s a rich, old school candy cherry soda flavor with a little bit of acidity. That tartness is critical to the soda’s nostalgic flavor and gives it not only a really pleasing taste, but also a fun mouth feel. It also imparts a refreshing crispness to the soda that adds to its drinkability.